VCO has been classified as functional food that contains very high nutrients which promotes health benefits. This tropical oil is widely embraced worldwide. Recently, VCO is crowned as a superior oil product and is highly competitive in the food supplement industry. Much research conducted by nutritionists, pharmaceutical representatives and scientists from the USA and Philippines on VCO. 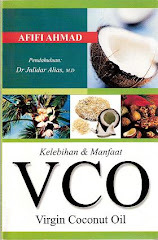 The result shows that VCO is high in nutrients and has therapeutics values for many sickness/diseases. Researches by Dr. Bruce Fife, Dr. Murray Price, Dr. Jon J. Kabara, Dr. Mary G. Enig & Dr. Conrado S. Dayrit (Philippines) proves that VCO could improve the quality of health. The unique structural make-up due to its medium chain fatty acids (MCFA) plays a big part for the improvement in health benefits. The Lauric Acid in the coconuts fat is a medium chain fatty acid (MCFA). MCFA does not increase cholesterol level but rather neutralized the cholesterol. It also increase high metabolic rate and does not contain high calories. Thus, it is a beneficial substance in order to maintain healthy body weight. MCFA also increase the immunity system in our body. Lauric ACID characteristic is anti bacterial, antiviral, antifungal & antiprotozoal. Therefore, VCO is a beneficial product in defense against any infectious diseases caused by infection of bacteria, virus, fungus, and protozoa. MCFA can convert energy in our body without the assistance of enzyme such as insulin. Thus, it is useful for immediate energy booster. It helps the cells in our body to gain sufficient energy to function effectively. It is also an effective and natural way to lose weight.